Constructing malls in Africa has become the new darling for many global investors given Africa’s expanding middle class and its insatiable appetite for the good life; from fine dining, to the thirst for anything imported including clothes, home appliances and groceries. Virtually every major store chain and fast food franchise is beating a path to Africa spurring a demand for quality retail space. It may not appear so now but in a decade Africa will be as large as Asia in population and every major brand name worth speaking of realizes this and is staking a claim in the region. The flurry of developments of malls in Africa’s major capitals such as Cairo, Lagos, Johannesburg and Nairobi is therefore not a surprise and research has shown that this trend is set to continue for the foreseeable future. Indeed the demand for shopping malls has taken on a life of its own and each new development is more lavish than the last as they seek to meet the need for a growing retail experience in Africa. The demand for retail space is set to grow in coming years. A recent study by CBRE confirms these facts and shows that the African market has begun to receive growing interest from European retailers with South Africa being at the top of the list. CBRE is a global commercial real estate services and investment firm. The combined effect of China’s slowing economy and a growing middle class in Africa has made constructing malls in Africa attractive but the shortcomings surrounding infrastructure has been the only blight in this rosy picture and this has stimulated the construction industry to respond. South Africa remains the most attractive market for retail space development because wealth is more favorably distributed in the various cities as compared to other African countries where it is mainly concentrated in the capital city. Needless to say the more sophisticated population and the improved infrastructure in South Africa are added attractions. 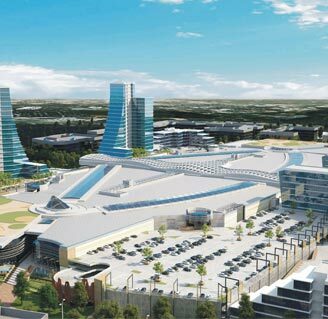 On the cards in South Africa the 1.4 million square foot Mall of Africa is nearing completion. Located in Midrand the mall is touted as the largest mall in Africa ever to be built in one phase. This is significant because in most cases malls are built in phases stretching over several years in order for investors to limit their exposure and begin to get a return in a shorter period. Nigeria has also seen its own flurry of mall constructions with several currently under construction in Lagos, Abuja and Ibadan. Currently the one that holds the mantle of being the largest mall in Nigeria is the Ado Bayero Mall located in Kano, Northern Nigeria. The mall covers an area of 260,000 square feet and was completed in 2014. The mall has about 50 stores and parking for about 1000 vehicles. By most standards the mall is small though there are plans to build a second phase that will consist of a hotel and amusement park. Soon to take over the distinction of being the largest mall in the country is the Palms Mall. Currently the mall covers an area of 210,000 square feet but once the current extensions are completed the mall will have a total of 645,000 square feet of lettable space with a 420,000 square feet multi-level parking lot making it the largest in the country. Despite the social upheavals in Egypt the country has also seen its share of mall developments in the recent past. Worth mentioning here are the Mall of Egypt and the Mall of Arabia both of which will boast over 1 million square feet and when completed will range amongst the largest malls in Africa. The Mall of Egypt is a 1.7 million square feet mall being developed by Majid Al Futtaim (MAF) Properties in Cairo. The US$800 million project will mirror the Mall of the Emirates in Dubai and will feature international fashion and lifestyle retail brands, a ski park, a 17-screen cinema, a family entertainment centre and over 50 food and beverage outlets. MAF incidentally has exclusive rights on the giant French franchise Carrefour in the MENA region and Central Asia. The first phase of the Mall of Arabia opened in 2011, while the second phase is expected to open soon. The Mall of Arabia is touted as Egypt’s biggest mall in terms of space and store numbers covering 2.69 million square feet. In Kenya East Africa’s largest mall is set to open soon. Two Rivers which will have 660.000 square feet of commercial space while not even half the size of the Mall of Africa or the two largest malls in Egypt will none-the-less set the bar higher for any future entrants in the East African region as developers keen on attracting foot traffic set out to outdo their predecessors. This mall it is said will feature the ubiquitous water feature when it comes to malls but an exception is that it will have dolphins to boot. Other recently opened malls are the Garden City Mall, which is half the size of Two Rivers, the Waterfront and a number of smaller ones in satellite towns outside Nairobi. In Uganda Acacia Mall is arguably the largest mall in the country with a floor space of about 370,000 square feet. Interestingly enough according to studies done, in South Africa over 60 percent of shopping is done in malls compared to less than 30 percent on average in the rest of Africa and so the general thinking is that as both increase in the size of the middle class and the trend towards experiencing retail therapy continues to rise, the development of malls will continue with pressure being exerted on developers to build ever larger and more exciting establishments in order to attract global brand names. It has become all about size and attractions and so incorporating amusement parks of one sort or another is par for the course along with boasting some kind of green star rating for use of renewable energy and recycling water.